There’s more to Pinterest than beautiful mood boards and inspiration. Here’s how to make the most out of the platform and use it to promote your work. A never-ending fountain of inspiration, Pinterest is a platform that’s all about visual creativity and discovery. This strictly professional environment is free of FOMO-inducing selfies of friends, freeing you to fully submerge yourself in your tasks of picking out color palettes or researching mid-century type. On Pinterest, probably the least social of all social media channels, ideas and great visuals are valued more than followers or likes. Engagement between users is kept to a minimum, to the extent that the platform went as far as removing its own ‘Like’ button earlier last year. This makes using Pinterest a whole other art to designing for social media platforms like Facebook and Instagram. Since its launch back in 2010, Pinterest has become an integral part of most of our work processes, and it’s a favorite go-to place for finding inspiration. 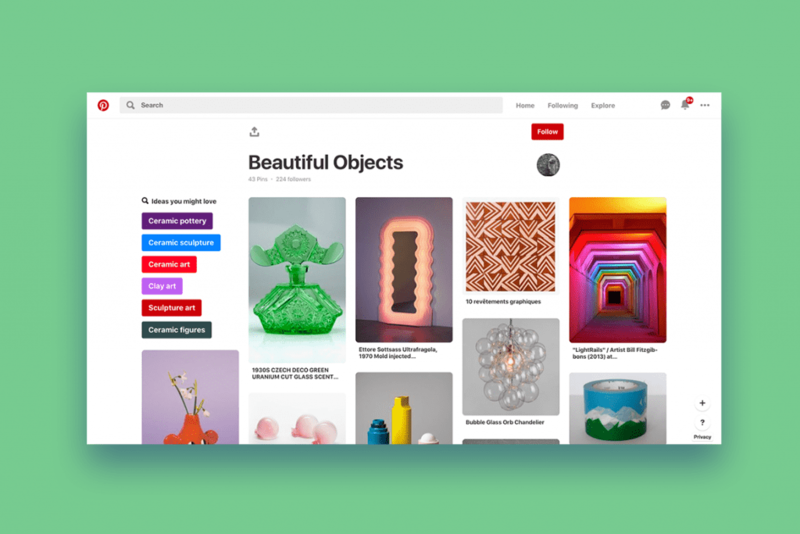 Yet, there’s an added perk to the platform that’s overlooked by many designers, as Pinterest is also a great tool for promoting your own work. We’ve pinned down a few tips to help boost your Pinterest account, from optimal image sizes to the best board titles. As for the creative ideas, however, we leave those to you – and to the pins you’ll encounter. Liking your own photos is a pretty awkward move on most social media channels. But on Pinterest, it’s what the cool kids do. Or more precisely, they pin them, as pinning your own work could get your designs circulating around the platform. Since the Pinterest algorithm suggests related images based on users’ personal preferences and searches, there’s no knowing where each pin could end up. In other words, your art can reach the feeds of people who weren’t previously familiar with your work, but were searching for something just like it. Create a board or two that showcase your own creations. But don’t overdo it and go too promotional, as the majority of your boards should be dedicated to your inspiration and ideas. – All pins should lead to your website: The pins that you create will hopefully sprout wings and fly, straying far from your own boards and into new and exciting realms. For that reason, each pin you create should be able to find its way back home. And when we talk about the Web, what is home if not your online design portfolio. Linking your pins to your website or online store means that people who come across your art, can immediately be redirected to its original web source – your portfolio – to find out more. 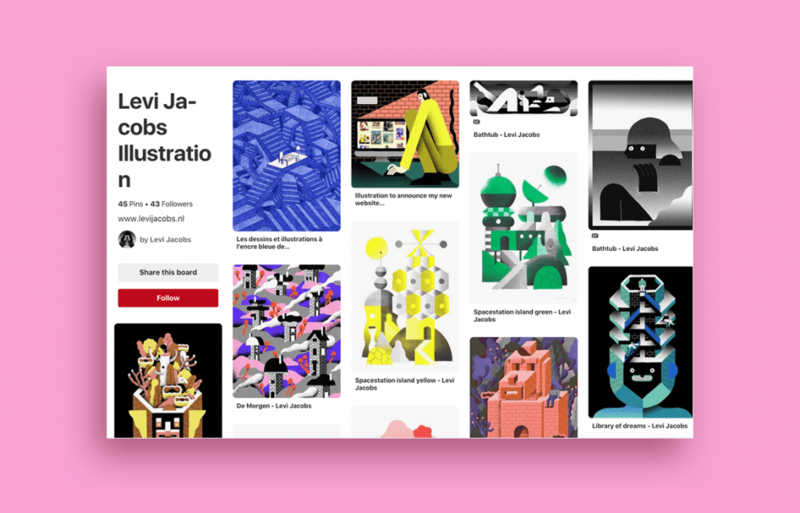 Illustrator and Wix user Levi Jacobs has created a Pinterest board to showcase his own creations, titled ‘Levi Jacobs Illustration’. – Add pin descriptions: While Pinterest is a visual platform, the right use of text can make a big difference. Adding short written descriptions for each of your pins can help maximize engagement. Explain what the pin is about in a few brief sentences, around 100-500 characters long. Pinterest is basically a search engine, not unlike Google, which means that keywords are an important factor in the way it evaluates search results. Therefore, your textual descriptions should include a few keywords, just like you would do for your portfolio’s SEO. In order to pick out the best keywords for your needs, ask yourself what people would type into Pinterest if they were looking to find images similar to yours, and include those words in your text. For example, notice how illustrator and Wix user Naomi Wilkinson captioned her illustrated feline print as ‘Leopard print A2’. She didn’t neglect to mention her own name as the creator of the image, so that it would remain there for future repins. Another way to perfect your keywords is by typing your own text into Pinterest’s search bar, and see what suggestions show up right below it. Those are related words that people usually search for alongside your keywords, and therefore could help make your own caption more specific. 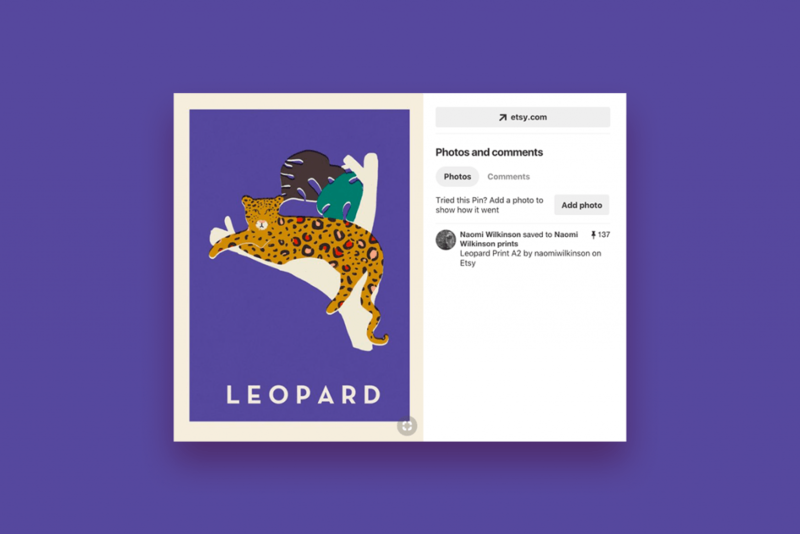 You might want to consider something along the lines of ‘Leopard print illustration’, ‘Leopard print art’, or ‘Leopard print poster’, depending on what works best for your content. 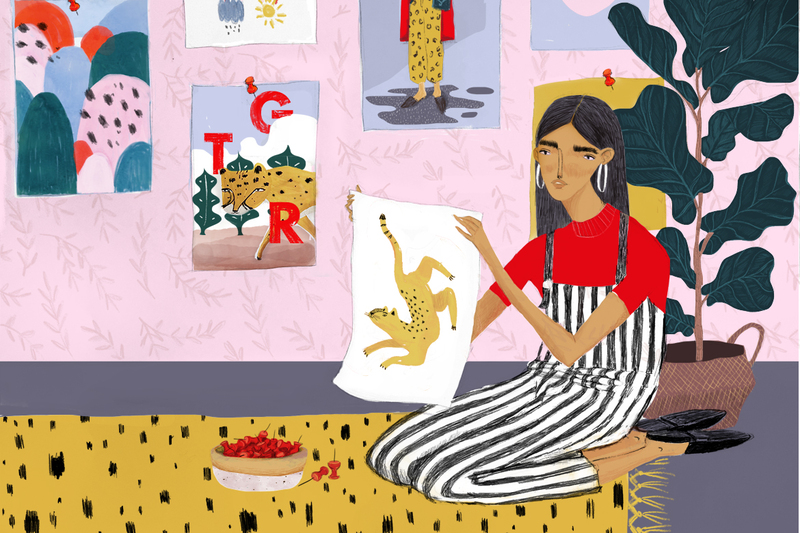 Illustrator and Wix user Naomi Wilkinson‘s pin, Leopard Print, links to her online store. – Keep pins coming with new content: Whenever you add new content to your online portfolio, don’t forget to add it to your Pinterest boards as well. Updating your social media with fresh content is always a good practice, and the same holds true for your Pinterest account. – Pinterest pin dimensions: Since Pinterest displays pins vertically, tall pins perform better than wide ones. The recommended dimensions for a Pinterest pin are 600 px wide by 900 px high, but those can vary. More important is to retain an aspect ratio of 2:3, or similar. Pinterest has a Chrome extension that enables users to easily convert any image they see online to a pin. But for those visitors browsing your site that don’t have the extension at hand – prep your portfolio so that it’s ready to be shared in an instant by adding social buttons to all images, including the Pinterest Save button. And since sharing the love should go both ways, link your personal website back to your Pinterest account, together with all of your other active social platforms. Your Pinterest account should be as polished and branded as the rest of your online presence. Edit your settings to add a logo, icon or photo as your profile pic (165 x 165 pixels is the optimal size). Fill in your location and add a brief introductory sentence in the ‘about’ section. Now enter the most important stage of all – it’s time to claim your website. This step is crucial, as it will make both your URL show up in your bio, as well as allow you to see what people are pinning from your portfolio. It will even automatically add your logo to all future pins. Lastly, confirming a website makes your account more reliable to Pinterest, hence giving your pins a boost in search results. Maintaining a beautiful Pinterest feed is fun. After all, you get to collect your favorite eye-candy and organize it into categories – what’s not to like? Your boards can be about anything, from striking lettering to quirky objects or your favorite logo designs. But looking at Pinterest from a professional standpoint, creating great boards is also an opportunity for you to provide your fans with a better understanding of your interests and sources of inspiration. Pinterest, as mentioned above, is a search engine that makes use of keywords. It is therefore recommended to include keywords in the titles that you give your boards, whenever possible. If you create a board for unique textile designs, for example, naming it something like ‘Fabric frenzie’ would make it less visible than a more straightforward ‘Textile prints and patterns’. Illustrator and Wix user Naomi Wilkinson‘s Pinterest boards, such as ‘Beautiful Objects’, can provide insight into some of her sources of inspiration. On top of the beautiful boards that are meant to be shared with the world, some designers prefer to brainstorm and research more privately. For those occasions, Pinterest offers the option of creating secret boards, that only you and the people you work with can see. 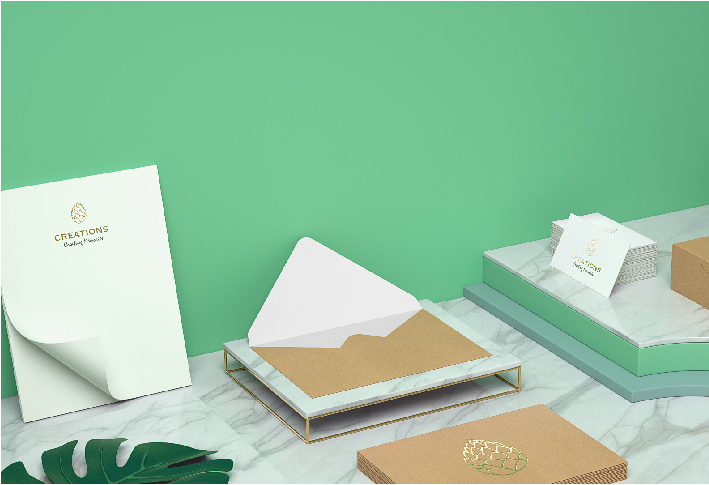 There, you can pile up all of your disorganized thoughts until finding that very specific dream decor for your new living room, while at the same time keeping your feed curated and professional. 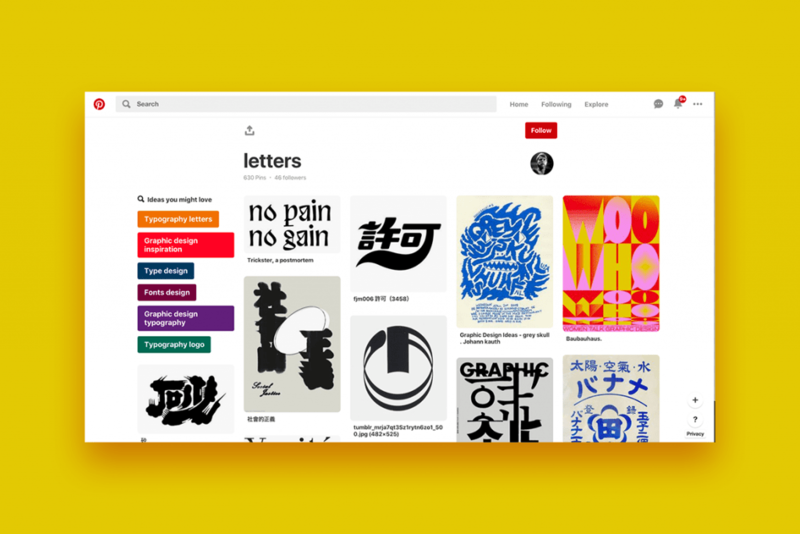 Designer and Wix user Simon Walker uses Pinterest to collect beautiful type, book covers, and other sources of inspiration.